The Great Exhibition in Hyde Park 1851. The Great Exhibition, also known as the Crystal Palace Exhibition, was an international exhibition held in Hyde Park, London, England, from 1 May to 15 October 1851 and the first in a series of World's Fair exhibitions of culture and industry that were to be a popular 19th century feature. 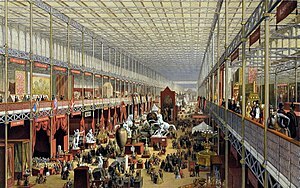 The Great Exhibition of the Works of Industry of all Nations (its full title) was organized under the leadership of Prince Albert and members of the Royal Society for the Encouragement of Arts, Manufactures and Commerce. It was a celebration of modern industrial technology and design. Its prime motive was for "Great Britain [to make] clear to the world its role as an industrial leader". Prince Albert, Queen Victoria's consort, was an enthusiastic promoter of the exhibition, which was self-financing. Queen Victoria and her family visited three times. Technology and moving machinery was popular, especially working exhibits. Visitors could watch the entire process of cotton production from spinning to finished cloth. Scientific instruments included electric telegraphs, microscopes, air pumps and barometers, as well as musical, horological and surgical instruments. A special building, The Crystal Palace,  was built to house the show. It took the form of a massive glass house, 1851 feet (about 564 metres) long by 454 feet (about 138 metres) wide. It was built with a cast iron-frame and glass. It was made almost entirely in Birmingham and Smethwick. It was designed by Joseph Paxton with support from structural engineer Charles Fox. The committee which oversaw its construction included Isambard Kingdom Brunel. The building was architecturally adventurous. Paxton's had experience designing greenhouses for William Cavendish, the 6th Duke of Devonshire. The Crystal Palace was an enormous success. It was an architectural marvel, but also an engineering triumph which showed the importance of the Exhibition itself. The building was later moved and re-erected in an enlarged form at Sydenham in south London, an area that was renamed "Crystal Palace". The building was destroyed by fire on 30 November 1936. ↑ Kishlansky, Mark; Patrick Geary and Patricia O'Brien. 2008. Civilization in the West. 7th ed, volume C. New York: Pearson Education. ↑ 3.0 3.1 "The Great Exhibition of 1851". Duke Magazine. November 2006. Retrieved 30 July 2007. ↑ Ffrench, Yvonne 1950. The Great Exhibition; 1851. London: Harvill Press. Prince Albert's speech of 1849, announcing "The Exhibition of 1851"
"In Our Time" BBC radio programme discussing the Great Exhibition and its impact. This page was last changed on 26 October 2017, at 01:31.